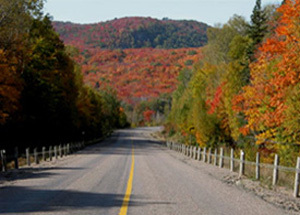 The Deer Trail is a 120 kilometer triangular motor route in the Elliot Lake region and is a must for all visitors. The Deer Trail parallels the Little White River approximately 20 minutes from Mountain View. A fantastic day trip is to begin at Art, Tarts and Tea in Kynoch then continue to follow hwy. 554 to 548 and go north on 548 to hwy #108 which will take to Laurentian Lodge. Laurentian Lodge is a must see lodge in the area and serves a great meal. The Moose Trail is an all day Northern Ontario adventure, approximately 7 hours. Go north on hwy. #129 and travel to Wawa, along the way stop and see Aubrey Falls and Chapleau. From Wawa travel south on hwy. #17 East to Sault Ste. Marie and back to Thessalon and onto hwy. #129. While in Wawa stop and see High and Magpie Falls. Wawa to the Sault is one of the most scenic drives in Canada along Lake Superior. Stop and see several of the spectacular shoreline views Lake Superior has to offer, like Old Woman’s, Agawa, Pancake and Batchewana Bay. The Visitor Centre at Agawa Bay a must experience and learn the local history and experience the life and artwork of the Group of Seven. At Pancake Bay stop in at the Canadian Carver where the specialize in Canadian carvings and native craftwork. The Sault offers all the latest and modern convinces for shopping and tourism attractions, local museums, boat tours, casinos, etc. St. Joseph’s Island is approximately 50 minutes away from Mountain View. St. Joseph Island , which is located at the mouth of the St. Mary's River between Lakes Superior and Huron, has been a favorite stopover for hundreds of years from First Nations people to settler in the 1800s to Americans in the early 1900's looking for a true "natural" experience to hundreds today who continue to enjoy the Island's unspoiled beauty, festivals and friendliness of its island folk. The Great Spirit Circle Trail is approximately 1½ hours away from Mountain View. Here you will experience the warmth and enthusiasm of Manitoulin Island's rich Aboriginal heritage. The Aboriginal culture of Northern Ontario Canada is as diverse is as diverse as it's lakes, rivers, and forests... as rich and abundant as the flora and fauna. Many travellers that have frequented its shores come to understand it as a land of dreams and the Anishnaabe have long since believed Manitoulin "Home of the Great Spirit" to be blessed. Home to the Ojibwe, Odawa, and Pottawatomi people, this picturesque island truly captures the essence of Aboriginal culture. For generations, the people of the Manitoulin/North Shore Region have maintained the culture and traditions as the way it was for millennia. Communities of the Great Spirit Circle Trail play host with a variety of products and services available. Travel the length of the Great Spirit Circle Trails network of highways with rustic bedrock shores formed by the pre-Cambrian shield. Explore the lush green landscape as you observe sites that reveal a colorful glimpse into the history of Canada’s Aboriginal people. Immerse yourself in our land of enchantment. Experience the oral traditions of our culture around the camp as our guides share stories and legends of the Ojibwe, Odawa, and Pottawatomi people. Indulge in Aboriginal cuisine in the relaxing, natural atmosphere of a tee-pee. Listen as your Aboriginal guide speaks the language of the land and come to understand how we have formed a spiritual connection to the environment. Hear the haunting cries of the loon. Feel the excitement of learning the language of the wolves. Catch a breath of cool refreshing air alongside with still waters of Georgian Bay and Lake Huron in the heart of Canada’s woodlands.